We offer very good quality Bicycle Pedals to our customers. We are one of the leading organizations involved in supplying cycle pedal which are developed by using latest technology. It is mechanical interface between foot and crank arm. Using premium quality stainless steel and plastics, we manufacture bicycle pedals in different sizes. These pedals comprise a spindle that threads into the end of the crank. The foot of the cyclist rests on the body structure. These bicycle pedals are free to rotate on the ball bearings with respect to the spindle. 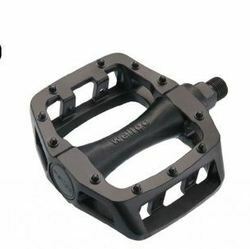 We offer bicycle pedals that usually consist of a spindle that threads into the end of the crank and a body, on which the foot rests or is attached, that is free to rotate on bearings with respect to the spindle. These Bicycle Pedals are made of premium quality raw material, which helps it to last for long. Plastic Pedals for MTB/ATB/Kid bikes Made from monoblock polypropylene with reflectors. Sizes : 86 mm, 95mm, 98mm, 100mm. Colour : Black, Blue, Yellow, Green, Flurooscent Yellow, Pink to order.